Game of verbal explosions where teams compete to yell out ten words listed under a given topic before time runs out. A new version of the game with updated content and packaging. 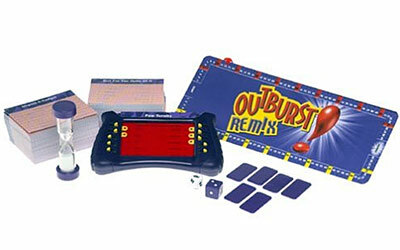 Invented in 1987 by Brian Hersch, Outburst has been licensed by Hasbro since 1994. Outburst is an exciting line that we expect will continue to be a big performer which will become even more relevant with a makeover in the fall, offering fun, wackiness, and topicality for young adults, and families. When the new game version launches this fall, classic Outburst was remixed with hot topics and content to create Outburst Remix. An energetic game surrounding verbal play and quick word association, teams can play or pass when they are given a headline. Upon choosing play, the team finds out the topic and then has sixty seconds to guess the ten words listed on their playing card before the time runs out. Players shout out everything that comes to mind and score points each time they say a word listed on the card. With six hundred relevant topics covering common knowledge and beyond, the game keeps players thinking, laughing, and shouting.